You have not proven any of my pictures are bogus. I've been asked a lot of questions about my various pictures and video, but not one, not a single one has been proven "bogus." lux wrote: Oh, they're using a wide angle lens from the ISS and it can image cities and towns and show them laid out in an evenly spaced grid pattern of dots. That must be some lens. You're not making any sense. There's nothing mutually exclusive about using a wide angle lens and seeing the grid pattern of the roads and cities. Even that pattern is equally distorted by the lens. 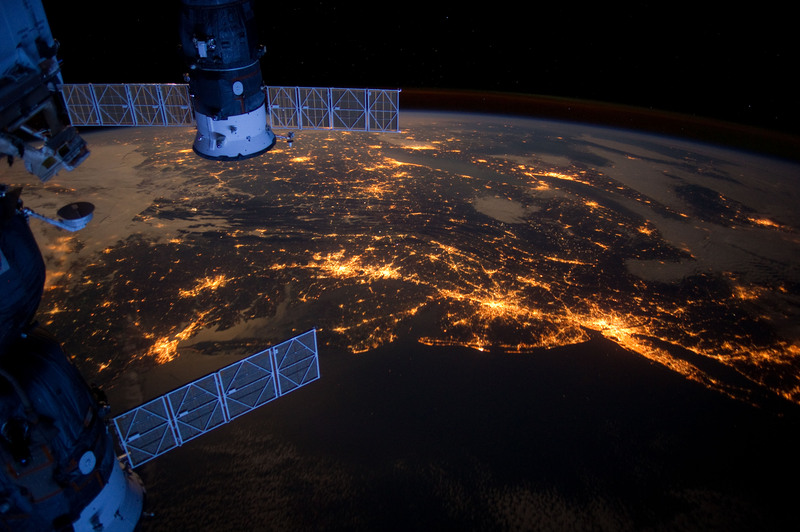 Show me a still photo (not from the animation you posted) taken with a wide-angle lens from the alleged distance of the ISS above the Earth that shows roads on the Earth's surface. And, state also the focal length of this lens and the camera or imaging device it was mounted on. astronut wrote: No, I'm not here to do your research for you. If you want to make a claim that the image is somehow wrong it's up to you to do the research and prove it. Uh, you have that backwards, astroboy. YOU posted the unbelievable animation and made certain claims about it so the onus lies with you to show it is legit. astronut wrote: You have not proven any of my pictures are bogus. YOU have not proven anything you've stated since you registered here. Nor have you responded to questions asked and requests made to provide such proof. When legitimate questions are asked of you, you only respond with arrogant puffery and insults. Dear Astronut - or may I call you "Scott Ferguson" now? I remember you calling me a liar, a few days ago. I am now going to 'return the favor' and call you out as a fraud, a professional liar - and most likely a NASA plant. Ever since you joined Cluesforum, you have failed to answer in any rational/comprehensible manner to the many questions submitted to you by various members of this forum. To be sure, you claim to be an amateur astronomer and an expert of earth-to-space photography. As it is, your arrogant/pedantic behavior has been evident ever since you joined this forum. Well...if we are to believe for a minute in Paolo Nespoli's artificial-looking images - how could we possibly believe in yours? 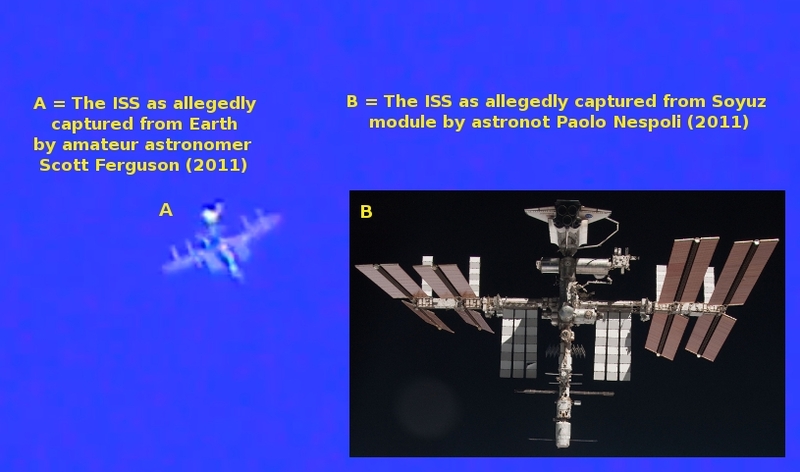 Do I really need to point out the discrepancies between the ISS shown in your imagery - and the ISS depicted in the NASA imagery? Even though I can only conclude that you are a total fraud, I will give you one last chance to respond in a manner that might possibly explain/justify what we can observe in the above pictorial comparison. I doubt that you can - but good luck anyway! Astronut - where were you on 9/11? Did I give you permission to use my full and real name? I don't recall doing that. I remember you calling me a liar, a few days ago. Yes, and at the time it seemed mysterious why you would lie about the number of attachment points between the shuttle and external tank. I think I have a better understanding now of why. I am now going to 'return the favor' and call you out as a fraud, a professional liar - and most likely a NASA plant. Those are extraordinary claims. I hope you can provide extraordinary proof. Ever since you joined Cluesforum, you have failed to answer in any rational/comprehensible manner to the many questions submitted to you by various members of this forum. I made many replies, and they were all perfectly rational and comprehensible. What exactly are you claiming is a contradiction? If you want me to respond to them, then yes, you actually need to clearly state a claim. You have not done so. Even though I can only conclude that you are a total fraud, I will give you one last chance to respond in a manner that might possibly explain/justify what we can observe in the above pictorial comparison. It is up to you to state what you think indicates my image is a "total fraud." My image was filmed from the ground, in broad daylight, using an 8" Schmidt-Cassegrain LX200 which was tracking ISS from an altitude-azimuth perspective. That perspective is constantly changing throughout the pass and it is also subject to field rotation. Now if you have a valid reason for thinking my image is fake, state it. HonestlyNow wrote: Please, if you could, identify which large city metropolis the lights in the right corner represent, so that we can figure out if the rest of the image makes sense geographically. Thanks. No, I'm not here to do your research for you. If you want to make a claim that the image is somehow wrong it's up to you to do the research and prove it. So, are you saying that you don't know the answer to my question? Did this piece of imagery come to you with no explanation whatsoever about what location on earth that it allegedly portrays? HonestlyNow wrote: So, are you saying that you don't know the answer to my question? Did this piece of imagery come to you with no explanation whatsoever about what location on earth that it allegedly portrays? I don't care wheter this new ISS footage is faked or not. For me its a proven fact that there are man made vehicles flying around in space. Just enter your location at the website and get the information about stuff that is going to fly by. It's all irrelevant to the reason why I posted that image. Again, if you want these details, find them yourself. It's not my job to do your research for you. The context in which this animation (nightside earth flyby ...) was posted was to show that stacking images would lead to blur (page 42 of this thread) - which is easy to see or know. It could be interesting to know what it depicts. It's source was not mentioned AFIAK. Which does NOT invalidate any other things that where said by astronut here. Proceeding to "all incredible" based on this alone (and not even knowing the source) would be a cheap strawman. And, of course, it being judged "incredible" would not mean, much less prove, it being fake. Even much less everything else from the one posting it being fake! I was following this thread for some time and would too be very interested in your description of the discrepancies you perceived between the video and the Paolo Nespoli photo. Last edited by whatsgoingon on Fri May 24, 2013 7:44 am, edited 1 time in total. Did my previous post even get noticed before you made yours? Last edited by whatsgoingon on Fri May 24, 2013 8:51 am, edited 1 time in total. thanks for the honest answer, thats a start. My view: there are plenty of satellites ... very obviously. "Nasa is build on ether." do you mean "eighter" or really "aether"? Aether being the concept of a (unknown - and not yet and never will be - proven) medium which would make the current theory work better. That is a physical basis, though an unproven and unprovable one. don't focus on one unexplained feature - you all know it's not important; you don't know and neighter does he. Or maybe he does, what difference does that make - he will tell or you will know regardless at some later time...? Focus on what the man is saying, telling, explaining, asking - apart from this one feature. whatsgoingon wrote: It aint science according to the founding principles of the Scientific Method. Reproduce it or continue to perpetuate cold fusion and the other hardly factual scientific claims made this and last century. All of these important discoveries where arrived at by following the scientific principle - cold fusion included. Is it reproducible? We don't really know, do we? It's said it's not. But is it? Or is that what we are told? The scientific principle cannot tell - man can alter ,restrict and favour certain "results". And they will, if they can. Unconciously probably, but still trying to defend and perpetuate their model against changing and evolving. do not hang it all on this one and only thing he put in as an example for something else. Focus on the other stuff. Last edited by Jonathan on Tue Feb 28, 2012 8:04 am, edited 1 time in total. Last edited by whatsgoingon on Fri May 24, 2013 8:52 am, edited 1 time in total.